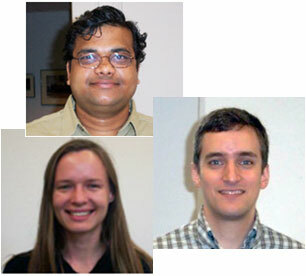 Three Carnegie/CDAC supported post-docs have accepted positions in the National Labs (pictured clockwise at right). Raja Chellappa joined LANL in May. He is working with Dana Dattlebaum in the the Shock & Detonation Physics Group in the WX-9 division. He will be studying structural phase transformations and decomposition behavior of energetic materials in broad pressure-temperature regime. Luke Shulenburger will joining the high energy density plasma theory group at SNL in July. His primary area of responsibility will be the ab initio computation of materials properties under high pressure and temperature to be used in conjunction with the experimental work on the Z-machine. Amy Lazicki (currently at CEA, France) will begin work at LLNL in September. She will be joining Rip Collins' group to do laser shock compression studies of low-Z materials at extreme pressures, to probe for new material states.